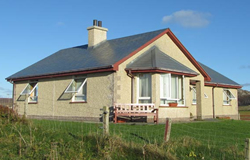 This spacious three bedroom holiday cottage has been awarded 4 stars by the Scottish Tourist Board. The cottage sleeps 6 people - 1 kingsize ensuite bedroom, 1 kingsize room and 1 double room. The living room has stunning sea views and the fully fitted kitchen also has a large dinning area. The cottage has full oil central heating and electric is by coin meter (£1 coins). The main bathroom has a bath and the ensuite has an electric shower, all linen and towels are provided. Fuidaigh cottage is less that 5 minutes walk to the nearest beach and 5 minutes walk to Polochar Inn which offers Bar & Restaurant menus. The location is ideal for a holiday whether you are interested in walking, birdwatching, fishing or just relaxing.